I just checked in here at the Hilton Americas in Houston for the 2009 Cooperative Baptist Fellowship General Assembly, 2009 edition. I’m honestly not really looking forward to the meeting this year. The family couldn’t be here and it’s shaping up to be a really busy week. 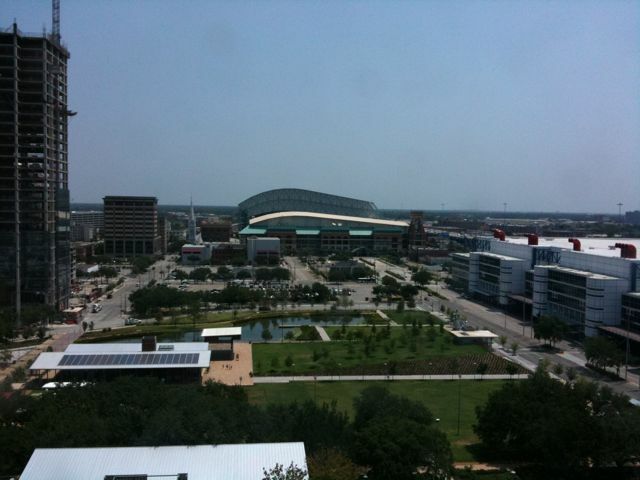 (but I do have a nice view of Minute Maid Park from my hotel room window…too bad the Astros are in San Diego this week. Theory U: Leading from the Future as It Emerges; The Social Technology of Presencing (spelling intentional) by C. Otto Scharmer — This book will lead to several other books to be added to the stack. 8W8 – Global Space Tribes: A Postmodern Journey through Globalization in the Internet Age by Ralf Hirt — I stumbled upon this while browsing the Kindle store. I hesitated…reconsidered…hesitated…downloaded the sample…bought the book. This tribal idea continues to raise it’s head in my thinking about how TCBF and/or CBF might be able to proceed in the future. Kohlberg’s Stages of Moral Development (Chapter 7 of W.C. Crain’s Theories of Development)–just one chapter of a book. This was emailed to me by a friend of mine in Amsterdam and it added some interesting info for our ongoing discussion of faith/church/etc. on our other blog. One particular interesting question this reading has me contemplating is whether or not our churches (as they typically develop) actually inhibit moral development as opposed to nurturing it. Eragon: Inheritance by Christopher Paolini–My 3rd grader’s choice…He obviously could read this himself but asked if we could read it together. It’s been fun…it’s also sacred…has to happen everynight before bed. I’m sure some of this will begin to pop up in some of my blog posts. What I really need is a regular face to face conversation about some of this stuff.